Via Slashdot comes news that the United Nations' World Digital Library is now online with hundreds of old maps, books, and other documents available for public perusal. The map shows the route that would have been taken by the ships that carried those two brothers, one of whom you can blame for having an ancestor who annoys people with his blog. 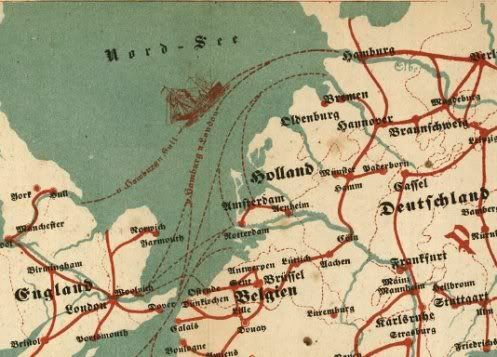 First they leave Bremen and head for the English Channel. Having traversed the Channel, it was off to the North Atlantic heading south. If you look at that bunch of four lines, you may be able to make out that the second one down is labeled "nach Philadelphia" or "to Philadelphia". Here you can see the various routes to Philadelphia, Baltimore, New York, and other harbors. 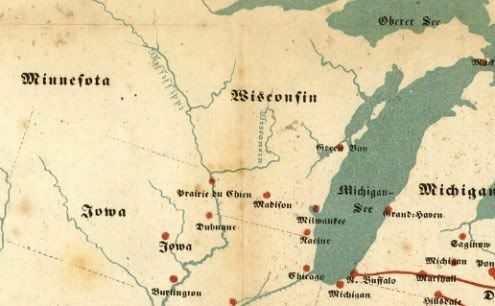 Many Germans made their way to Wisconsin so what does the Emigrant's Guide have about us?